The Slalom canoe paddle is ready for what you can give it. The smooth neck to blade transition is always comfortable and the ovaled shaft above the neck gives you the control you want. If you want choices, this is the "factory custom" paddle. 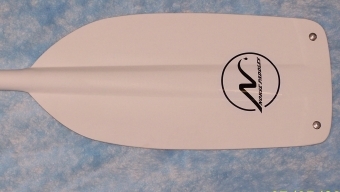 The Slalom comes in a standard 8" blade width, with the choice of a standard or square tip. The tip guard choice is the standard riveted aluminum or "dynel"tip. Blade sizes from 18" to 22" in inch increments. Note: Square Tip shown. The Slalom paddle comes in 4 shaft options. 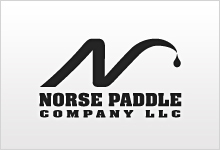 The standard Norse paddle shaft is made with a proprietary process of an epoxy/Dynel/durable film matrix and is compression molded to a 1 1/4" or 1 1/8" diameter 6061-t6 aluminum seamless tube shaft. Available in .049" heavy duty wall (1 1/4" only) or .035" regular duty wall. The outside finished diameter is approximately 1 9/32" or a 1 5/32" diameter for smaller hands. Or the choice of the fiberglass "skypole" shaft outside diameter is 1 1 /4".The flex of fiberglass provides less fatigue to the paddler. Offered in paddle lengths from 48" to 64" in inch increments. Add a Carbon fiber/kevlar and s-glass blade layup with a dynel tip to this paddle for $55.00, see the products page to order. These paddles are made to order. Paddles usually ship within 7 days of order payment . You will be notified by e-mail when your order ships.